This view of the volcanic plains of Neptune's moon Triton was made from topographic mapping of images obtained by NASA's Voyager 2 spacecraft during its August 1989 flyby. NASA released new pictures of Neptune?s freezing moon Triton,made from data taken by the Voyager 2 spacecraft on its way out of the solarsystem in 1989. 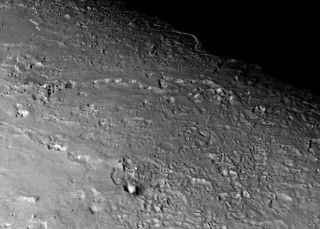 The close-upshots reveal Triton's pockmarked surface, covered with crater scars fromyears of space rock impacts, as well as smooth volcanic plains, mounds andround pits formed by icy lava flows. The photographs were released to commemorate the 20-yearanniversary of the Voyager flyby ofthe moon, the last solid object visited by the spacecraft. The images weremade using topographic maps derived from Voyager 2 photographs. Among its discoveries at the moon, Voyager 2 revealed thatTriton has active geysers. And with surface temperatures at minus 391 degreesFahrenheit (minus 235 degrees Celsius), Neptune'slargest moon is one of the coolest objects in the solar system. The unmanned Voyager 2 probe launched in 1977 on a grandtour of the solar system, visiting Jupiter, Saturn, Uranus, and Neptune, aswell as many of their moons, before moving on to interstellar space. The probe is currently about 8.4 billion miles (13.5 billionkm) from the sun, or almost 90 times the distance between the sun and Earth. Voyager2 and its sister, Voyager 1 (also launched in 1977, and currently thefarthest away man-made object, at about 10 billion miles, or 16 billion km fromthe sun) are still operational and still transmitting data. Both probes carry with them golden phonograph records withsounds chosen to communicate a sampling of humanity to any extraterrestriallife they may encounter. The contents, which include greetings in 55 languages,as well as music such as Bach's Brandenburg Concerto, gamelan music fromIndonesia, Louis Armstrong's "Melancholy Blues," and many others,were chosen by a NASA committee headed by Carl Sagan.